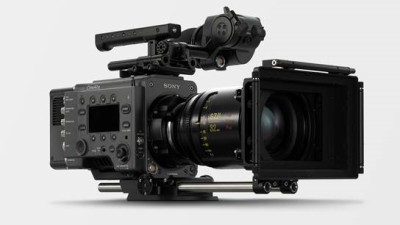 Sony Electronics is unveiling VENICE – its first Full-Frame digital motion picture camera system. VENICE is the next generation of Sony’s CineAlta camera systems, designed to expand the filmmaker’s creative freedom through immersive, large-format, Full Frame capture of filmic imagery producing natural skin tones, elegant highlight handling and wide dynamic range. VENICE was designed through close collaboration with the creative community, fulfilling the requirements from filmmakers and production professionals. VENICE will be officially unveiled on Sept. 6, in front of a select audience of American Society of Cinematographers (ASC) members and a range of other industry professionals. Sony will also screen a short film, “The Dig”, the first footage shot with VENICE, produced in Anamorphic, written and directed by Joseph Kosinski and shot by Academy Award winning Cinematographer Claudio Miranda, ASC. VENICE combines a newly developed 36x24mm Full Frame sensor to meet the high-quality demands of feature filmmaking. Full Frame offers the advantages of compatibility with a wide range of lenses, including Anamorphic, Super 35mm, Spherical and Full Frame PL mount lenses for a greater range of expressive freedom with shallow depth of field. The lens mount can also be changed to support E-mount lenses for shooting situations that require smaller, lighter, and wider lenses. User-selectable areas of the image sensor allow shooting in Super 35 mm 4 – perf. Future firmware upgrades are planned to allow the camera to handle 36mm wide 6K resolution. Fast image scan technology minimizes “Jello” effects. A new color management system with an ultra wide color gamut gives users more control and greater flexibility to work with images during grading and post-production. VENICE also has more than 15 stops of latitude to handle challenging lighting situations from low-light to harsh sunlight with a gentle roll-off handling of highlights. VENICE achieves high quality and efficient file-based production through Sony’s established 16-bit RAW/X-OCN via the AXS-R7 recorder, and 10 bit XAVC workflows. VENICE is also compatible with current and upcoming hardware accessories for CineAlta cameras (DVF-EL200 Full HD OLED Viewfinder, AXS-R7 recorder, AXS-CR1 and high-speed Thunderbolt-enabled AXS-AR1 card reader, using established AXS and SxS memory card formats. VENICE has a fully modular and intuitive design with refined functionality to support simple and efficient on-location operation. It is the film industry's first camera with a built-in 8-stage glass ND filter system, making the shooting process efficient and streamlining camera setup. The camera is designed for easy operation with an intuitive control panel placed on the Assistant and Operator sides of the camera. A 24 V power supply input/output and LEMO connector allow use of many standard camera accessories, designed for use in harsh environments. With VENICE, Sony is giving users the option to customize their camera by enabling the features needed, matched to their individual production requirements. Optional licenses will be available in permanent, monthly and weekly durations to expand the camera’s capabilities with new features including 4K anamorphic and Full Frame, each sold separately. The VENICE CineAlta digital motion picture camera system is scheduled to be available in February 2018. For more information, please visit:www.sony.com/venice.